The origin of the giant failure in the earth was found out by scientists from Moscow State University. They discovered a new geological phenomenon, previously known only for the icy planets. 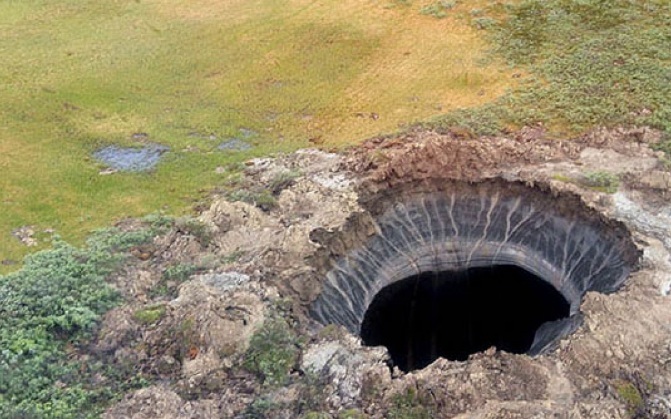 Yamal crater, failure, funnel, hole, finally – as soon as they did not call this rare natural phenomenon in the whole world. Unexpectedly appeared in the bare tundra four years ago, the crater immediately attracted the attention of scientists from different areas. “To call this process cryovolcanism, it was necessary to find this giant crater, its diameter was 20 meters, and the depth was about 50 meters. This is a grandiose funnel, being on the edge of which, you understand the extraordinary power of this process. Such was not previously known. And, of course, this raised questions about how this crater was formed, ”said Andrei Bychkov, a professor at the Department of Geochemistry, Faculty of Geography, Moscow State University. Until now, scientists called cryovolcano processes that occur on the icy satellites of Saturn. Gas jets are thrown from the surface of the planets into space for hundreds of kilometers. On Earth, such processes have never been recorded before. In the course of several expeditions, geologists still managed to understand how the first cryovolcan formed, which came into the sight of scientists. The physics of this process can be compared with a bottle of champagne, placed in the freezer. Frozen soil puts pressure on the walls of the formed chamber, which contains carbon dioxide and water. The pressure increases, water forms on the surface, mixes with the gas and knocks out the soil cover, like a cork from a bottle. The power of the Yamal cryovolcano explosion was such that the earth was thrown a distance of 300 meters from the epicenter. The activity of such volcanoes on Earth is not the highest. “Why did this phenomenon occur infrequently? Exactly such explosions? Because often the dirt cover does not withstand pressure and starts to crack, and the gas escapes through the cracks. Here, the confluence of circumstances, the confluence of all factors was such that the force with which this lid broke, acted instantly, ”said Vanda Khilimonyuk, associate professor at the Geocryology Department of the Geological Faculty of Moscow State University. Two times in the same place, cryovolcan does not erupt, unlike its hot counterparts. Therefore, scientists are now engaged in a detailed study of the mechanism of the origin of volcanoes, so that in the future one can predict the appearance of huge craters and thus secure the region in which a quarter of all the country’s blue fuel is mined.